Once affectionately known as Sleeping Beauty, Bordeaux has awoken from its slumber in recent times and is now one of France's most exciting, vibrant and dynamic cities. Visit the city to discover rich neoclassical architecture, striking new structures designed by world-class architects and reclaimed former industrial wet docks at Bassin à Flots. More than half of Bordeaux is now UNESCO-listed, making it one of the world’s largest World Heritage sites, promising a treasure trove of things to see and do. Bordeaux has always been a place dripping in good taste, but its renowned elegance and rich history is now majestically mixed with 21st-century vitality and style. We have pick-up locations throughout the city and at Bordeaux–Mérignac Airport so that you can easily explore the sights and discover the delights of the city and its stunning surrounding towns and vineyards - this is one of France’s most famous wine regions, after all. Browse our car collections and pick the vehicle that fits the bill for you – we have everything from family SUVs to sportier numbers if you’re travelling solo. One of the great pleasures of visiting Bordeaux is to stroll through its graceful streets lined with beautiful buildings, eating well and then driving out to explore the surrounding vineyards and the sumptuous south-west coast of France. It’s a truly gorgeous part of the world, and it’s waiting for you to discover it in its entirety. Head to the heart of Bordeaux and find the Triangle-d'Or (Golden Triangle), framed by the streets Cours Clemenceau, Cours de l’Intendance and Allées de Tourny. Here, you’ll find the finest expression of the city's 18th-century grandeur. The elegant boulevards are lined with top-end shops, bars, cafés and restaurants. At the south-eastern point is the Place de la Comédie, overlooked by the Grand Theatre with its magnificent neo-classical façade and intricately-decorated auditorium. A short walk away, facing the River Garonne, is the Place de la Bourse, enclosed on three sides by the majestic Palais de la Bourse. The city’s former stock exchange mirrors the grandeur of Versailles and looks out across the majestic miroir d’eau, a vast expanse of shimmering shallow water that perfectly reflects the palace. It’s best seen floodlit at night, when the effect is truly mesmerising. Afterwards, make for the medieval St. Pierre district, a lively warren of narrow streets and pretty little squares begging to be explored. Here, you’ll find joy at every turn in a maze of majesty packed with off-the-beaten-track bars and fantastic, romantic restaurants. Running through the middle, you’ll find the 1-km long Rue Ste Cathérine, a more affordable shopping alternative to the eye-watering price-tags in the Triangle d’Or. Wander through the world of wine, explored in fascinating depth at La Cité du Vin, a museum housed in a stunning building resembling a wine decanter on the banks of the River Garonne. Bring the oenophile dream to life as expert guides lead you around 20 different themed sections covering everything from vine cultivation, grape varieties and wine production to the ancient wine trade and 21st-century wine trends. In a city built on wine production, it’ll come as no surprise that Bordeaux has some incredible restaurants serving the best vintages. The two Michelin star Grande Maison de Bernard Magrez is run by the award-winning chef, Pierre Gagnaire, while Philippe Etchebest, host of French TV's version of ‘Kitchen Nightmare’ has taken over at the Grand Theatre's restaurant. As well as high-end dining, the city is also steeped in hearty south-west French culinary traditions with dishes like Pauillac lamb, local Bazas beef and wood pigeon in red-wine sauce. Embark on a classic Bordeaux experience and spend a Saturday morning slurping down Arcachon Bay oysters from a seafood stand in the city's legendary covered food market, Marche des Capucins. No visit to this regio would be complete without a tour of the city’s surrounding vineyards. Car rental in Bordeaux will give you the freedom to do it at your own pace. Stop off at Saint-Émilion, a beautiful old wine town 40 minutes’ drive west from Bordeaux, or head out to the Gironde estuary where you’ll find famous Bordeaux wine châteaux such as Latour, Margaux and Mouton-Rothschild. One of the best-known Médoc wineries and one of the region's oldest is the Château Lynch-Bages, 2km south-west of Pauillac, in the tiny hamlet of Bages. Round things off with a meal at Café Lavinal, a chic village bistro run by the same family. Bordeaux is perfectly situated for your exciting exploration of south-west France. It’s less than an hour’s drive to the graceful old resort of Arcachon via the A63 and A660. 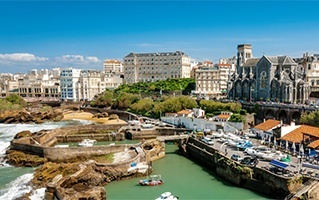 From here, drive south and explore the beautiful Gironde coastline, or continue on the A63 all the way to elegant Biarritz, close to the Spanish border. The region’s famous vineyards are all close by. Saint-Émilion is 45 minutes east, while you can find the town of Pauillac and classic Médoc wineries of the Gironde estuary within an hour’s drive north of the city. If you’re picking up your hire car at Bordeaux-Mérignac Airport, it’s just a 10km drive into the city via the D106. The airport is just beyond the city’s ring road, the A630, which becomes the N230 on its eastern side. As well as giving access to the A63 to the south-west, the A630 also leads to the A62 to Toulouse and the south-east and the A10 which heads north-east to Paris via Orléans. The old centre of Bordeaux is pedestrianised, so if exploring here it’s best to use your hotel’s parking facilities or park in one of the city’s main car parks, which are cheap and located close to all the main sights. The speed limit on motorways – Autoroutes – is 130 km/h. Autoroutes are toll roads, indicated by blue signs and marked ‘Péage’. Pay with cash or card (Visa/Mastercard). Dual carriageways are indicated by green road signs with a speed limit of 110 km/h. The speed limit on main single carriageway roads is 90 km/h and 50 km/h in built-up areas. Limits drop on all roads in wet weather. When buying petrol (Essence), Sans plomb is unleaded and Gazole is diesel. Opening hours: Mo-Fr 0800-1200 1400-1700, Sa 0800-1200 1500-1800, Su closed.